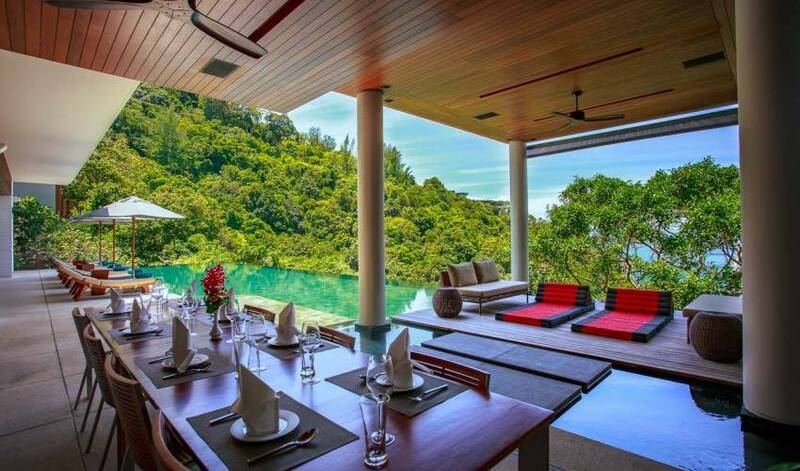 Nestled in the tree-tops on a hillside of Kamala Bay, you will find the exceptional 4-bedroom Baan Banyan Villa. The contemporary, luxury villa blends perfectly with unspoilt natural surrounds of the tropical jungle that grows thick and wild on the headland. Perched up high, the uninterrupted views from the villa are simply stunning as it looks out over the secluded bay below. The villa complex at Baan Banyan comprises 3 main buildings, all of which are connected by walkways. It has been built to accommodate families or groups, and as such, there are 4 master bedrooms and 2 additional bedrooms, all with ensuite bathrooms. The large villa can comfortably entertain groups up to 12 persons easily, and still not feel crowded. 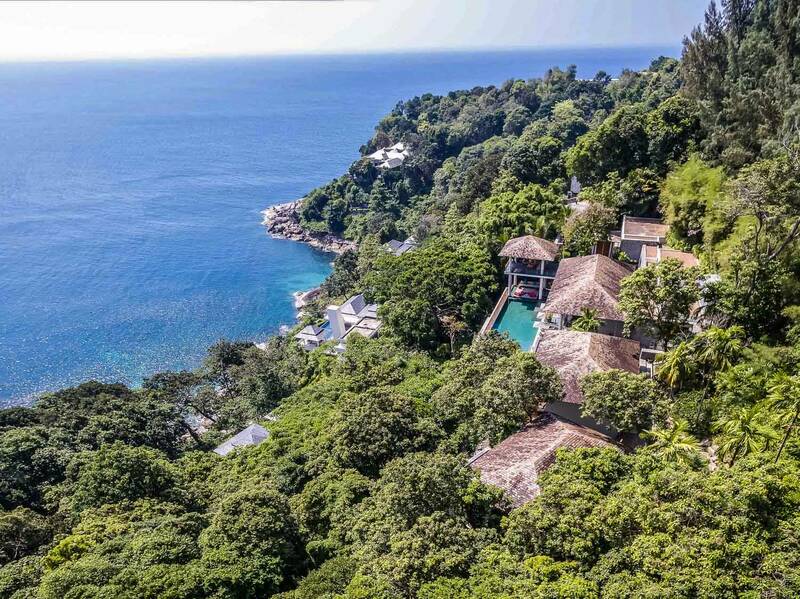 Built onto a promontory on the west coast of Phuket, the villa is afforded some of the most stunning sunsets that Thailand has to offer. 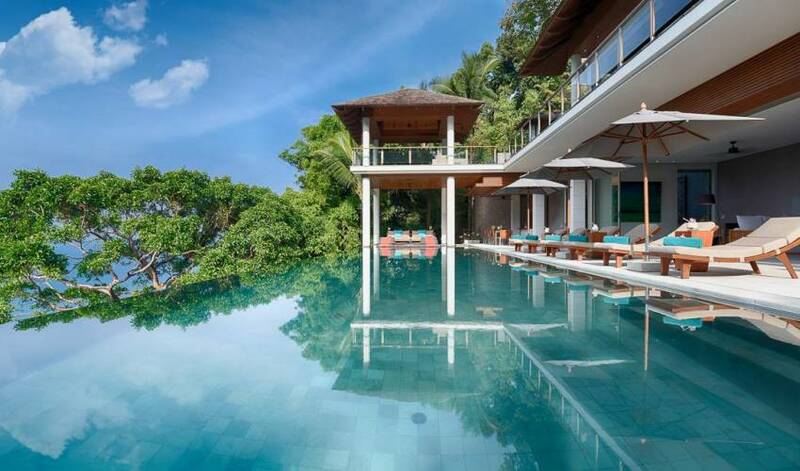 The 18 metre long infinity pool drops away and the azure Andaman takes over as the perfect backdrop. Ample and varied locales about the pool provide spots for sitting, lounging and dining. However, no matter where you are within the villa you will always have breathtaking views of the ocean, and the spectacular sunsets. Watch the sky change through innumerable shades of pinks, purples and oranges before the glowing orb sinks into the sea. There simply couldn’t be a better way to end a day. 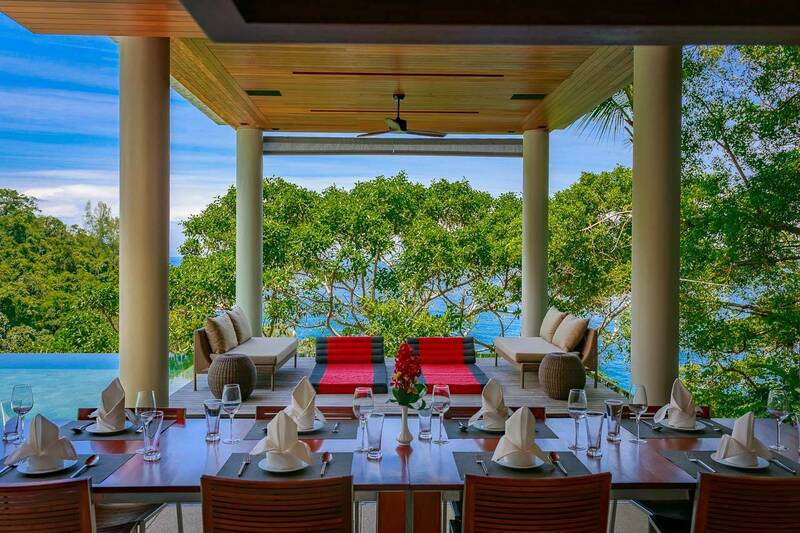 If you ever tire of the ocean views, Baan Banyan has you covered for entertainment. There are large flat-screen televisions in each room to watch your favourite sport or movie, a fitness room, a ping-pong table and even a dedicated Sala to practice Yoga or meditation. For those who love nothing better than curling up on vacation with a good book, then there are endless quiet spots to find solitude between the pages. The villa is fully-staffed by trained professionals whose job it is to ensure your stay is unforgettable. Nothing is too difficult or too much trouble, and the villa has gained a reputation for having some of the friendliest and helpful staff you will find on the island. After a stay in the Baan Banyan, you will come to understand why Thailand has such a reputation for hospitality. The four master suites at Baan Banyan all contain King-size beds and large private ensuite bathrooms. The bathrooms contain either jacuzzis or large bathtubs and rainfall showers. The design of the bedrooms is simple and makes the most of natural materials and colors. The beautiful hardwood timber used extensively in the bedrooms is accented with soft white cotton bedding and pillows. Each bedroom at Baan Banyan contains a safety box, entertainment system and flat-screen television with cable movies. Bedroom open onto their own private terrace with magnificent views overlooking the ocean. The wooden shutters can be closed for privacy, or left open so that you can fall asleep in the evening to the sound of the ocean below, and then wake again in the morning to its beauty. Why not enjoy a freshly-brewed morning coffee on the private balcony, as you breathe in the clean ocean air and consider the day’s possibilities ahead. Apart from the 4 master suites, the 2 extra guestrooms in the main building add versatility to the villa. Although smaller than the master suites, they are able to be configured in either King or twin-bed configuration, and are perfect for additional guests or kids. Each of these guestrooms still have ensuite bathrooms and magnificent ocean views. Whether you are a group of couples, or families with kids, the sleeping arrangements at the villa can be custom configured to suit your needs. Baan Banyan is perfect for entertaining and provides a variety of living areas to do just that. The upper-level of the main building is where you will find not only the fully-equipped kitchen, but also the dining room. Adjoining the dining room is a casual living room complete with flat screen television along with an expansive wrap around deck. Dependent on your mood and the weather there are provisions for dining alfresco or indoors. The dining room can either be open to take advantage of the cool ocean breezes or closed up and air-conditioned if required. 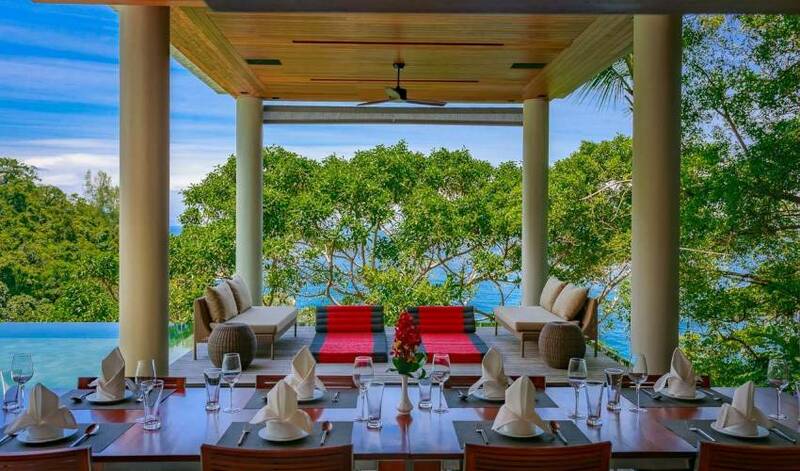 Outside is also a Thai Sala which is perfect for dinner, drinks, or to simply take a moment and soak in the natural beauty which is all around. Around the pool you will find areas for lounging, relaxing, or playing ping pong. This is also the perfect location for a barbeque. Why not have the villa staff prepare one for you? Fresh seafood is always a popular choice, sourced locally at the markets that day, you can be assured it will be delicious. 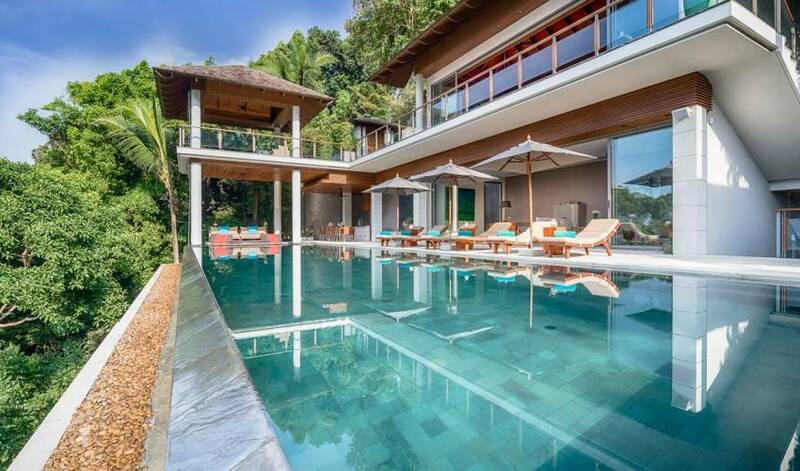 What would any luxury villa be without a delectable pool to lay about in? The 18 metre long infinity-edge dark slate pool blends seamlessly with the natural surrounds. 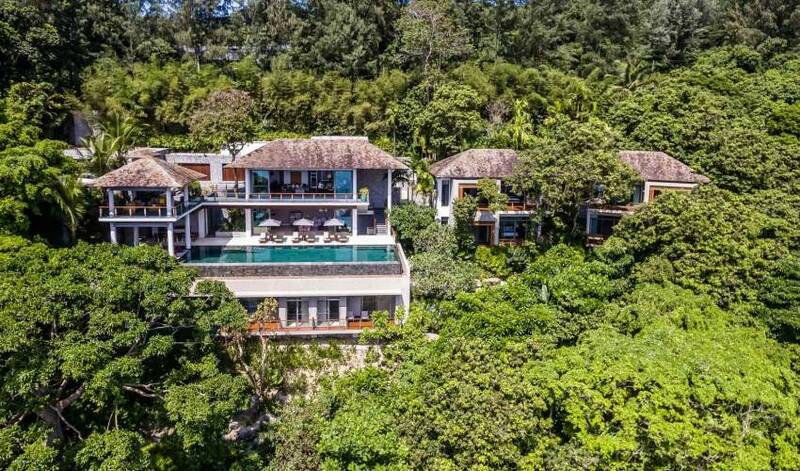 High in the tree- tops and surrounded by jungle it provides the perfect level of privacy and seclusion while maintaining unobstructed views of the Andaman. It is delightfully perched onto the cliff-face so you will always be swimming with a million dollar view. All around the pool are shaded areas to read, relax and unwind with the cool sea breeze on your face. There also wooden sunbeds for those who prefer to embrace the sun and want to spend the days working on their tan. If health and wellness is your thing then there is no reason to let your fitness routine suffer just because you are on holidays. Baan Banyan has a fully-equipped gym with everything you may need for your work-out; there is a treadmill, cross-trainer and rowing machine, as well as ample free weights. If you like running, then the 6 kilometre stretch of road over the headlands between the villa and Kamala Beach is both beautiful and challenging. But the best bit about taking a run here is that you will finish at one of the nicest beaches in Phuket. The long curved bay of Kamala is great for a quick dip into the ocean. Baan Banyan is the perfect place to take a family vacation. For those who love the outdoors, there is plenty of space to roam around and enjoy the natural environment. For the adventurous visitors there is a long winding path makes its way down the hillside to the ocean, where kids and adults alike can either plunge into the crystal clear ocean or explore the foreshore of the rocky bay. There are plenty of activities also available in the entertainment room. Kids can be left here to entertain themselves, and watch movies, listen to music or play games. The ping pong table is always very popular with guests of all ages. 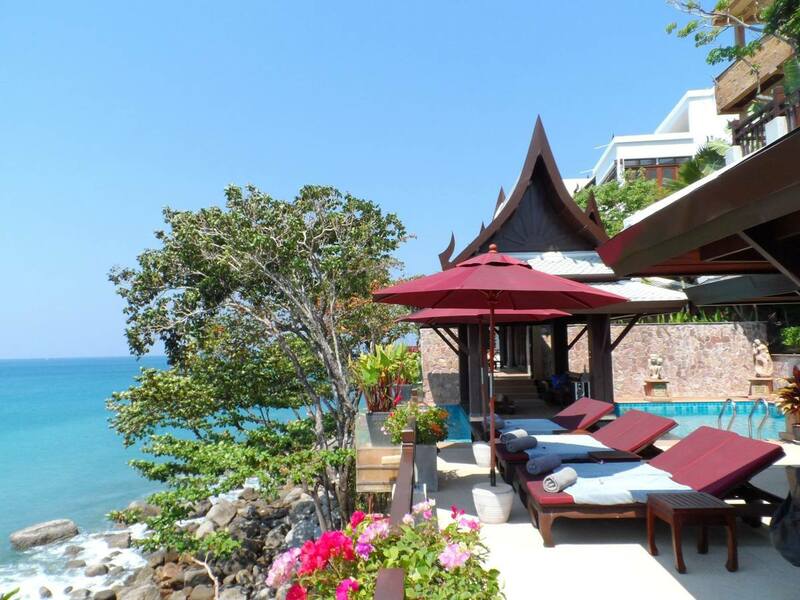 Baan Banyan is located on a secure compound with 24 hour security. Guests can rest assured that their safety is always assured while staying at the villa. Venturing out on the island, Phuket is a family-friendly destination and you will never run out of things to do or see. There are limitless opportunities for fun and adventure. Our villa staff can help you organize excursions to many of the popular attractions on and around the island. 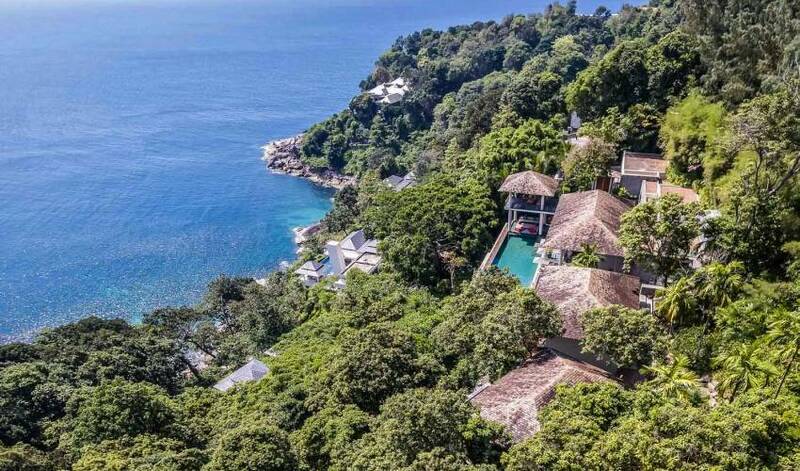 When you are at Baan Banyan surrounded by the ocean and the jungle you are completely isolated from the noise and crowds of some of the most popular tourist spots in Phuket. However, if needed then everything is only a short drive away. In a mere 10 minutes you can be at the lovely beach of Kamala, either swimming, shopping or enjoy some of the best beach clubs on the island like Cafe Del Mar and HQ Beach Lounge. 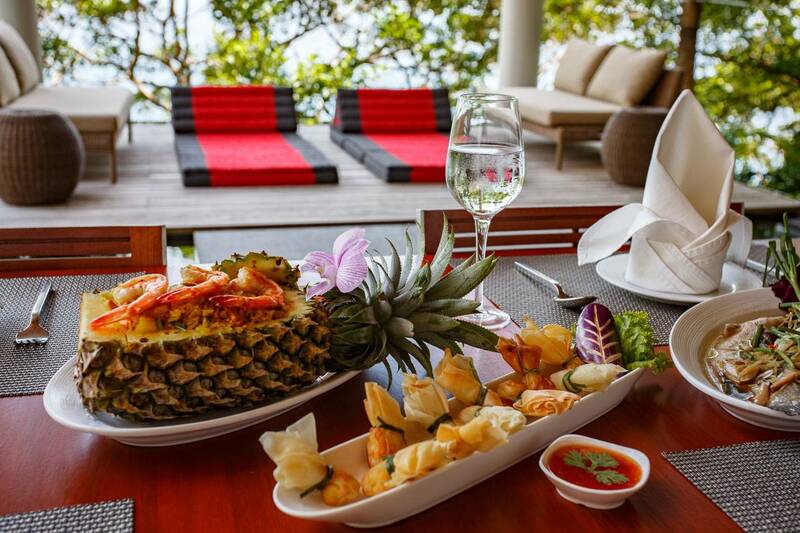 Venture further North along the West coast and you will find the high end districts of Surin and Bang Tao with numerous restaurants and the famous longtime favorite beach club Catch. A short drive in the other direction, towards the south is located the raucous town of Patong which is about a 25 min away. Here you will find a plethora of restaurants, bars and clubs. Phuket international airport is about a 45 minute drive from the villa, and Baan Banyan is happy to organize your transport if required. 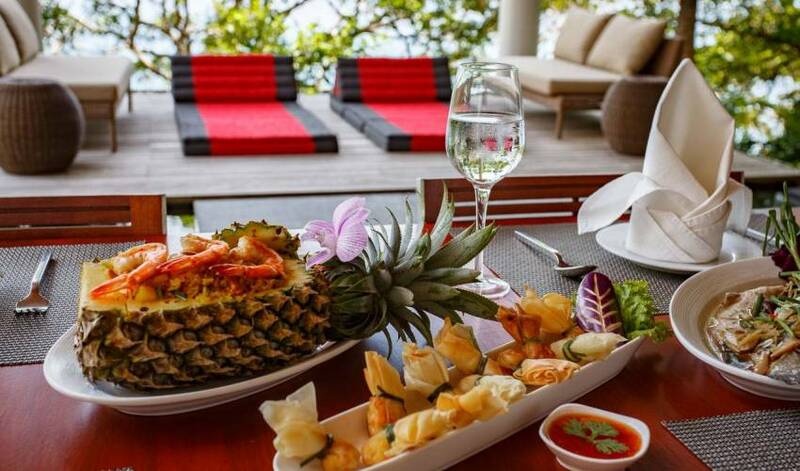 Baan Banyan could just be the best kept secret on Phuket. 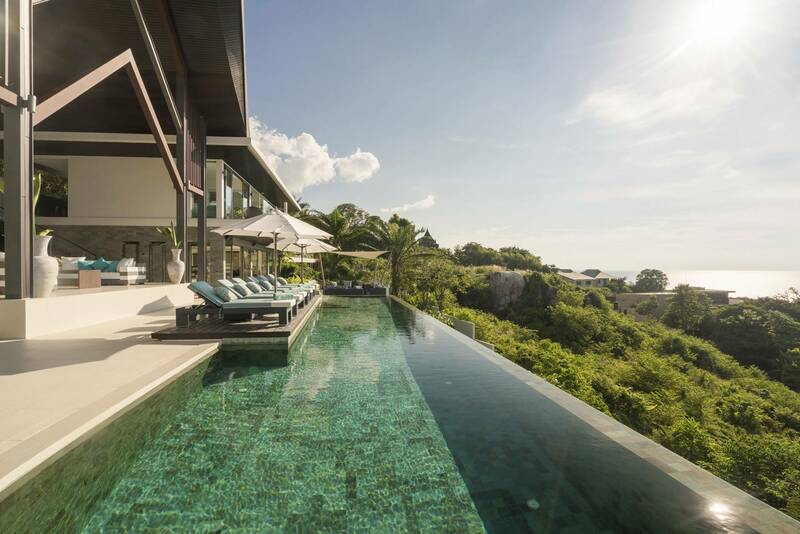 The photo's on the website does not do any justice for how incredible this Villa actually is. The attention to detail, the smell and aroma, the view, the features are all on a different level. We stayed in Thailand for 5 days and despite having plans to site see and do various tourist activities, my husband and I found ourselves not wanting to leave the villa. The villa comes equipped with 3 full time staff who are wonderful and so attentive. We would be in the pool and drinking coconuts would magically appear. They were attentive yet not invasive. The full time chef will cook whatever you desire at whatever time. Overall the experience and stay was incredible. You need to visit to really comprehend how beautiful the property really is. Our stay so far has been excellent! Our stay so far has been excellent! In this stunning serene location every detail in the villa, from the superb choice of decor to the high level of materials and craftsmanship at every turn must be truly recognised and appreciated. The staff have been very professional and helpful especially our villa manager, Ms Wan. Dining in the villa has also been a delight as the food has been superb. I would be grateful if you could pass on my highest regards to the villa owner for facilitating our stay in his beautiful residence. The Villa was fantastic, as was Waan. You have an incredible asset in Waan. I hope you convey our feedback to the owner. She made our stay absolutely wonderful. 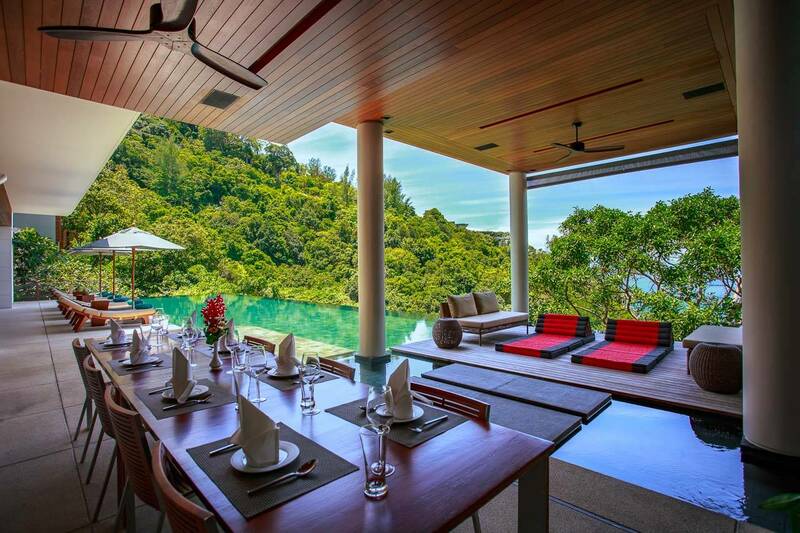 I will definitely recommend this villa to other friends. It truly was a spectacular villa and the level of service matched the beautiful surroundings. In particular, Kookkai in our opinion went over and above during our stay which made our holiday even more special and a large reason we would return to this villa. She was fantastic! Thanks again for your assistance in this booking and we look forward to dealing with your company in the future as we found the whole experience seamless. It was beyond fantastic. It was surreal! Thanks so much for all your efforts to get us there. My guests and my Family had the most wonderful time. We just didn't want to leave. As for the food. Well. Everything that was prepared for us was so amazing. The service was superlative and the staff were so attentive and engaging. Yes, that is the renowned Thai hospitality, but on holiday, it made the entire stay such a fulfilling and rewarding experience. They do try hard to please, but they do it so nicely! The accommodation. Yes, what a superb location away from all the buzz and naturally beautiful as well. Thanks to YOU Kris for your suggestion and the incredible subsidy you put in place. I believe you went way beyond what would normally be expected from the standard services you provide. You actually didn't have to do anything more than usual, but you did, and that is testimony to the extreme level of service you put into your work. We all appreciated the level of entreatment bestowed upon us and I thank you wholeheartedly for that. We enjoy so much in the villa, it's very nice and the staff are really helpful. Thanks for your recommendation, we have really great stay here.